Public Remarks: Single story, 3 bedroom, 1 bathroom home has tile in kitchen and bathroom and carpet through out rest of home. 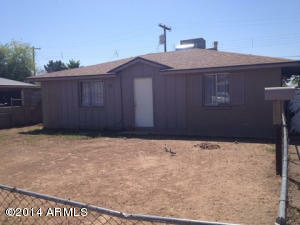 Large fenced in backyard with a covered carport area that can also be used as a patio. Home was upgraded with central AC unit last summer. Washing machine hookup located in kitchen. Home has gas stove and fridge provided. 910 square feet, built in 1960. Located at 67th Avenue and Osborn.